Well, I´ll write down a few words about myself also. I turned 40 in 1999 (whoaaa..), I´m married and have two kids aged 13 and 15. We live in Huddinge just south of Stockholm, Sweden. During working hours I´m with a large, well-known Swedish telecom company, working with product and process development. My spare time is scarce, but apart from working at the forge I of course spend time with my family, friends and try to keep up with everything else that needs attention. I also like cooking, and don´t mind a dram of Islay single malts from time to time. I´ve been interested in blacksmithing for quite some time through books, fairs and demonstrations. My great great grandfather was a master blacksmith in the southern part of Sweden, so it just might be that some dormant genes got busy late 1997 when I started building my forge in the back yard. Most of the information and litterature was found through the Internet and Amazon.com in Seattle. The general idea was to attend a blacksmithing course, but it turned out to be very difficult to match available courses with work and other obligations so I´m self-thaught mainly. I was difficult at first, but today it is possible to turn out pretty decent stuff once in a while. Recently I´ve bought a couple of instruction videos, and that was a good help also. Anyway, there is a great deal left to learn, and that´s part of the challenge that appeals to me. 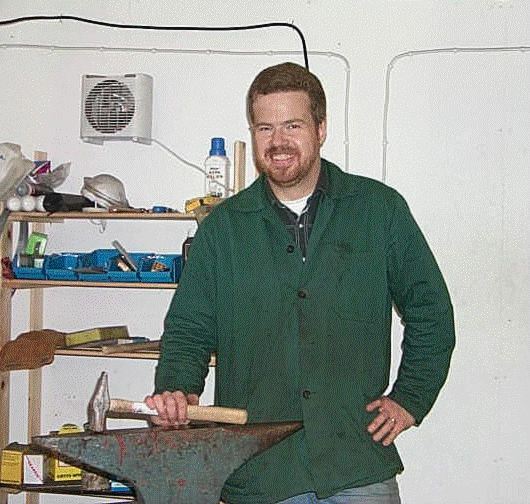 I´m interested in historically inspired blacksmithing, primarily the iron age-viking era. I do some everyday items relating to that period, like pennannulars, hooks, forged jewelery etc. This is something I plan to develop further. I´ve also helped out in building an outdoor forge for the Iron Age House in Körunda near the town of Nynäshamn. This is a historic site, where a large reconstruction of a longhouse has been built based on archeological findings nearby. See Links for details about the house, TechStuff for a description of the construction of the forge and Gallery for some pictures from the first ever Iron Age Fair held August 12-13 2000 and more. The biggest problem is to find enough time to spend at the forge, but the few hours I can get do provide a great way of relaxing. I have also sold some items locally, and it is a great feeling that people actually want to buy your stuff. It won´t make me rich, that´s for sure, but it helps financing some coke and tools anyway.